Take your post-military education goals to the next level. Campbell University's Online program offers classes in a convenient 8-week format designed for individuals who are interested in pursuing a course of study while balancing other obligations. Receive personalized instruction and quality courses taught by main campus faculty while completing your degree 100% online. The meaningful programs Campbell offers reflect the professional and vocational developments of our nation and world. The University wants to graduate students with exemplary academic and professional skills who are prepared for purposeful lives and meaningful service. Campbell University Online is proud to serve the men and women in the armed forces and the families that are part of the military community. We are a member of Service Members Opportunity Colleges (SOC) providing students with enhanced transfer opportunities and the chance to turn military training into college credit. 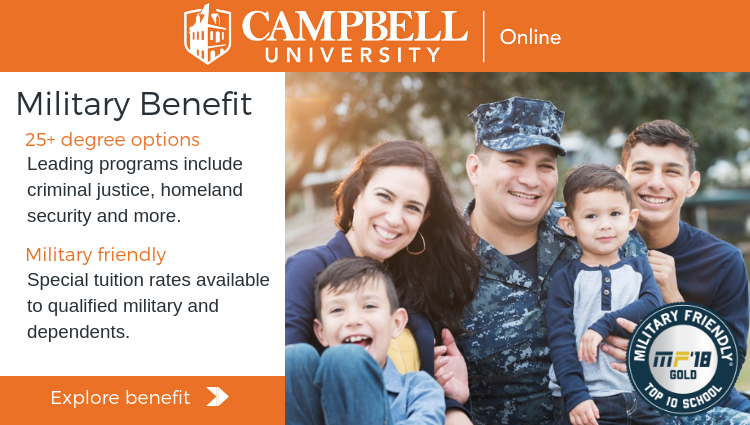 We are excited to grant qualifying students with the Campbell Online Military Benefit (COMB), a reduced tuition rate. This is our way of honoring the military community and expressing gratitude for their service. As we continue to grow together, we stand firm in our commitment to better serve all our students’ educational needs. Take advantage of Campbell University 's commitment to your service. Request info now on how you can enroll!